It is no real secret that I am a huge Styx fanatic. I have been listening to them since I was a little kid in the late 70s and early 80s. I’ve stuck by them through the lineup changes, solo albums and the long stretches without any new material. Since I have been working with TAM, I have interviewed members Lawrence Gowan and Ricky Phillips, covered their live shows, and wrote a piece for TAM’s column “How I got into THAT band.” So there is a good chance that this review may be pretty biased, but I am writing it anyway, and I am damned excited to have been given the chance to do it. A few weeks ago, I frantically loaded an advance review copy of The Mission to my iPad and cell phone so that I could take it with me to my trip to Chicago. It was only while I sat in the plane with the opening strains of “Overture” playing through my headphones that I remembered that Styx began in Chicago. The fact that I received my copy of The Mission right before my trip to Styx’s hometown is just a bit of kismet I suppose. I closed my eyes and began my journey both literally and metaphorically. By the time we had touched down in Chicago (after being diverted for 12 hours to Detroit due to heavy crosswinds), I had listened to The Mission at least ten times. My wife just let me lose myself in the album as the stress of the trip took its toll on all of us. When things would get difficult for me to deal with, I just put my headphones back on and started the album over. Heaven knows I need my crew, but how the hell do I get through to you? Of course, this is a review, and it’s my job to tell you if the album is any good or not. If you’ve gotten to this point of the article, then I am pretty sure that you can tell where I am going to come down on this. Yes, it’s good. It’s better than that. To me, it’s a masterpiece. But, as I wrote earlier, I am a Styx fanatic, which makes me pretty biased. I can comfortably declare that The Mission is officially my third favorite Styx album. It falls just behind The Grand Illusion and Pieces of Eight, barely knocking Paradise Theatre down to the fourth spot on my list. But, no matter where The Mission ultimately ends up on your favorites list, I can pretty confidently say that if you are a Styx fan, you are going to love this album. 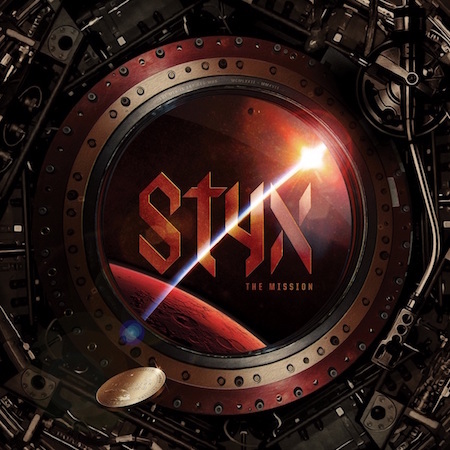 At it’s core, The Mission, is a rock and roll concept album with similarities to Styx’s previous concept albums, including Kilroy was Here. The story is a science-fiction adventure that follows the journey of the spaceship, The Khedive, and its six man crew as it embarks on the first manned mission to Mars and beyond. As the band did with Kilroy was Here, each of the three singers (Tommy Shaw, Lawrence Gowan, and James “JY” Young) take on a different role when singing their songs. Shaw sings as both The Pilot (aka Locomotive), and The Pilot’s father; Gowan portrays The First Officer; and JY plays The Engineer. Each character has a specific point of view and personality, and tells their part of the story in the fashion that we have come to expect from the different singers. No surprises there. The performances each fit like a well worn and beloved jacket, playing to strengths of the different singers. The first release from The Mission is called “Gone Gone Gone,” sung by Gowan, and fittingly tells the story of the The Khedive’s launch, and the crew’s excitement to get going and begin their journey. After that, Shaw sings his first song as Locomotive, “Hundred Million Miles,” a classic Shaw-style rock song about a guy thinking about the woman he leaves behind. JY performs his one and only solo-singing part next on “Trouble at the Big Show,” a crunchy rock number with the signature vocal and electric guitar growl his fans love him for. After that, the vocals on The Mission thread in and out between Shaw, Gowan, and the harmonies that Styx is notorious for. Of course, while the story and vocals are important, it is the actual music of The Mission that truly amazes me. Somehow the band has managed to capture the synth and guitar rock sound of the 70s and mesh it seamlessly with modern age production and newer musical stylings. The result is an impressive composition that, without a point of reference, makes the songs very difficult to place in a specific time period. It captures both the futuristic and space-opera like sound needed for the story, while still sounding like it comes from The Grand Illusion and Pieces of Eight era. So, was The Mission worth waiting 14 years for? Well… hell, I think it was worth waiting over 30 years for. Now, please excuse me… The Mission has just begun again, and I want to take one more trip to Mars before I head to bed. The Mission comes out on June 16, 2017 on the band’s label Alpha Dog 2T/UMeUniversal, and can be pre-ordered at Styxworld.com. Be sure to catch Styx on the road this summer with Don Felder and Reo Speedwagon on “The United We Rock” tour. Tickets on sale now.